Desk space / Work stations / Shared Office space AVAILABLE NOW. Creative networking. Central London address. from £200 per desk pcm all inc. Perfect solution for freelancers & small businesses. Need someone to look after your bookkeeping matters? 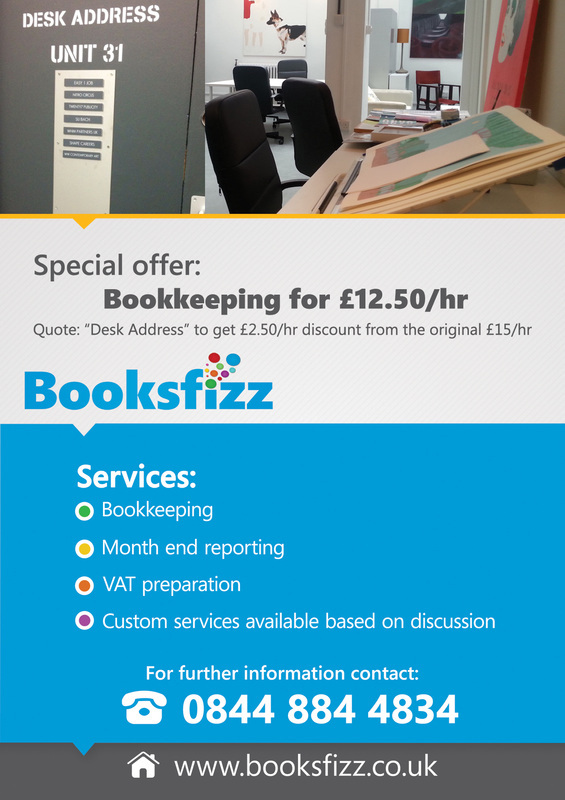 We are now working with Booksfizz, who can offer a discounted hourly rate of only £12.50 per hour. Simply quote "Desk Address" when you call them up. Desk space / Work stations / Shared Office space AVAILABLE NOW. Creative networking. Central London address. From £200 per desk pcm all inc.